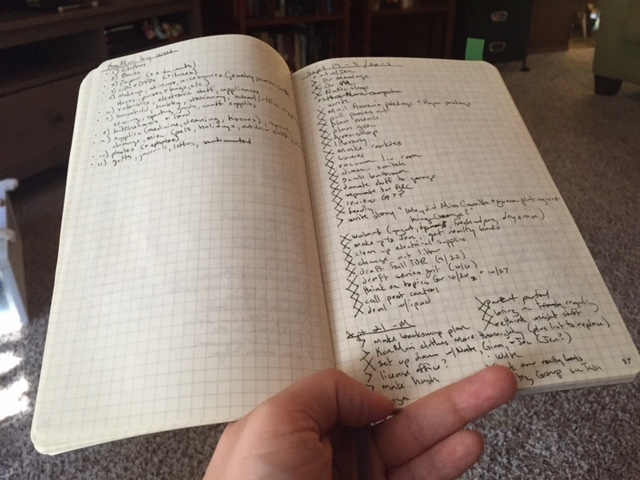 Over the years, I’ve tried multiple kinds of to-do list tracking. Back when I was working full time, I used the Franklin Covey method, but it no longer worked once I was a stay at home mom with a much more fluid schedule. I tried various planners from big-box stores, never finding one I liked. I started keeping a to-do list on index cards, which kinda worked for short periods of time. I tried phone apps after I got an iPhone, but those were generally awful. I prefer paper for planning. So I settled into using a generic big-box planner combined with index cards and really just not keeping good track of my events and to-do list. Enter bullet journaling. My friend Stephanie introduced me to the concept back in mid-August. I looked at the website and thought, maybe this would be okay. It wasn’t until I watched the short video that I was hooked. I went out and got a grid Moleskin to use and got to work. At first, I thought this was just going to be a planner, but it became more than just a way to plan. Sure, it has that. An expanding index, daily/monthly calendars/plans, future planning, etc. But the variety of pages in my Moleskin grew. I have pages for my tarot spreads, pages listing my general and book wishlists, pages for our family book club selections and the boys’ schedules and the needed house repairs and my personal projects and blog stuff… It’s not a pretty way to journal. I’ve seen the pretty to-do books that people have, and I couldn’t do that. I’m not a scrapbookish kind of person. This is not meant to be pretty. It’s meant to be functional, efficient, customizable, and personal. This particular journal is my first, and I already have plans about the next one, things to change up to make the method work even better for me. In fact, I love this method so much that I’ve branched out. I have my to-do list, but I now have two other bullet journals. One replaced a “writing ideas” notebook that I’d had for over a decade and that needed replacing anyway. 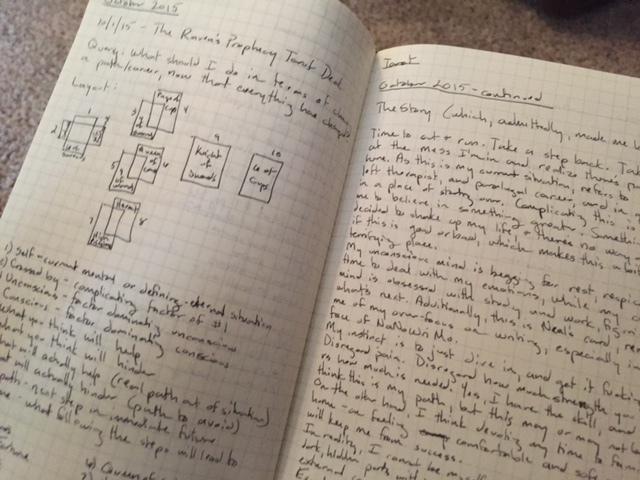 The bullet journal method works perfect for keeping together notes on various ideas and manuscripts, as well as any sort of submission tracking and mini-notes and drawings that I use for writing, etc. Adam? This is what the journal you gave me became: a place for my imagination to live. Thank you. The second bullet journal is helping me on my wellness journey. I’ve struggled with how to approach food, fitness, the scale, and my weight over the last few months. I have a tendency toward hyper-focus on numbers, and disordered thinking when it comes to food, calories, and my weight. At the same time, I become very disordered on the other end of the spectrum, if I rid myself of numbers completely, and end up binging and mentally beating myself up. I need to find a happy in-between. Since late September, Jason and I have been writing down our food every day. Not amounts, not calories or measurements or anything, just the food itself, and showing it to each other sans judgement. I’ve been keeping mine in a note on my phone, making a new one each day, and I’ve now moved this into the new food bullet journal. Having a running journal allows me to track multiple things – food patterns, exercise trends, particularly loved or satisfying foods/meals, how my mood/eating matches up to my hormone cycle, etc. It allows me to track when I’m eating well and when I’m eating emotionally, when I’m tempted to binge and when I’m falling apart mentally and when I’m just not hungry – all without numbers. And this is really helpful. Neither of these two secondary bullet journals are what the program was designed for, but I think it speaks a lot for the method that I loved it enough to adapt it to other parts of my life. Jason is using it as well now. He’s always struggled with different kinds of planning/organization, and I don’t know if bullet journaling will work for him long-term, but for now it seems to help him in planning things like weekly meals and work stuff and notes for his own writing. It also helps us to both sit down at night together and figure out what we need to do the next day, which we were terrible at before. Plus, we both take our journals everywhere, so it’s easy to grab needed info or add something right away. It’s wonderful. Seriously, I can’t recommend this technique enough. Take the time to watch the video at least. It’s awesome. This entry was posted in Wellness, Writing and tagged health. Bookmark the permalink. I was using (and enjoying) this method, but I’ve fallen out of the habit recently. I want to try again! I’ve not watched the videos yet, but this sounds like the “to-do” lists I used to make in my own journals. 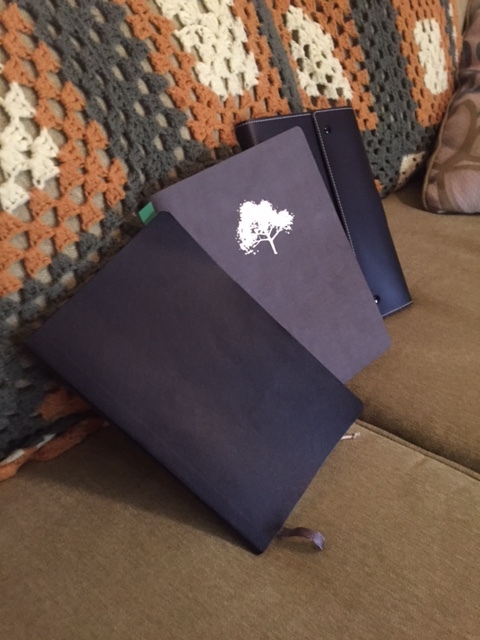 They were never as neat as the ones in your photographs, and they tended to repeat the same items over multiple lists before items finally got crossed off for good, but they were a fun and useful way to use my journal. I’ll check out the video. Part of the video talks about why he makes you repeat the same thing over and over, considering whether you still need it on there. It does feel very satisfying to finally cross things off, haha!